MMA heads back to Amman-Jordan, the place where it all began. 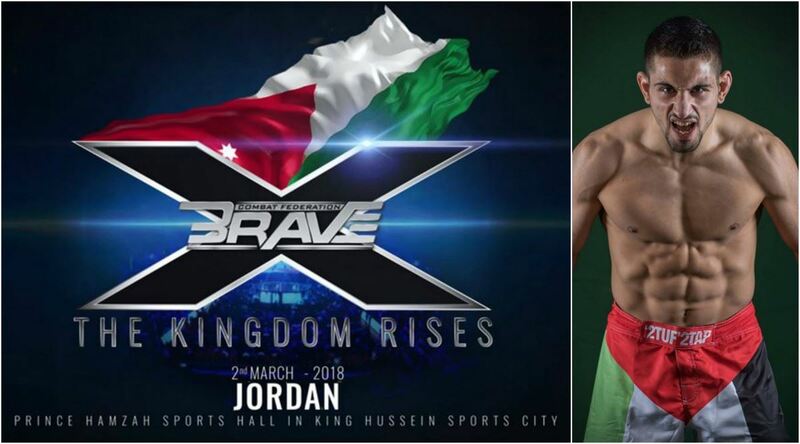 Brave Combat Federation has officially announced Brave 10 “The Kingdom Rises” to take place on March 2 at the Hashemite Kingdom of Jordan. Dubbed as the birth place of MMA in the Middle East, Jordan is home to some of the region’s best coaches and fighters. The country has produced top names in the sport including Jarrah Al-Selawe, Abdulkareem Al Selwady, Nawras Abzakh and Jalal Al Daaja who have recently showcased stunning performances at Brave Combat Federation. Early in 2010, Jordan served as the launching ground of Desert Force Championship, the first ever all-Arab MMA promotion coming straight out of the Middle East. Issuing one event following the next, the country quickly became a heartwarming home for MMA fighters hailing from the Arab region and a welcoming location for international competitors from all around the globe to visit. The Hashemite Kingdom helped boost the status of many local MMA fighters that we know and still support to this day, offering the constantly growing Arab MMA fan base live coverage of its events, and presented many upcoming MMA practitioners with a goal to aspire to. In time, it had delivered events almost all around the Middle East. It bred serious contenders, hot rivalries, crest champions. Now, after more than 2 years of MMA drought in Jordan, Brave Combat Federation has decided to come back to the original homeland of MMA’s establishment in the Middle East. Brave 10: “The Kingdom Rises” will offer the Jordanian fans a chance to see their beloved fighters compete once again in their home country against fighters from all around the world. The event offers a special nostalgic feel for both Arab fighters and fans alike. The promotion has so far announced a potential title-contention match-up pitting home grown talent and arguably the #1 pound for pound Arab fighter, Abdulkareen Al Selwady against one of UK’s best, Charlie Leary. The event will also feature a rematch between Mohammad Fakhreddine and Tahar Hadbi, two fighters who brought life again to true rivalries in MMA. Talks about Jarrah Al Selawe challenging the current Brave welterweight champion, Carlson Harris, have been in the rumor pipe, yet no official news has been released regarding the matter. Expect to see Nawras Abzakh on the card, looking for redemption after a strong yet unsuccessful promotional debut at Brave 9 in Bahrain. Jalal Dajaa, another mean prospect out of Jordan will most likely get a spot on the card, after an impressive first round TKO win against Jeremy Pacatiw in Nov.
“Brave 10: The Kingdom Rises” will take place on the 2nd of March in the prestigious arena of Prince Hamzah Sports Hall in King Hussein Sports City.